The OMNI V Blender will fit with its 2 liter 64oz CO-POLYESTER BPA-FREE square container (Eastman Tritan) under your kitchen cabinets, just like with the competitors from Orem Utah, (see picture to the right). A tamper made out of wood (poplar dowel) is provided for free of charge. The tamper is not for stirring or for breaking any forming of air pockets above the blade. This tamper tool is there for "just-in-case" and safety only, just in case if you do get stuck and need such a tool. You should not ever use a spoon, fork, or your hand to clear the blade. Besides, the wooden tamper tool makes a great sword toy. Best of all, the OMNI V Blender with the 2 liter 64oz container can be used on some of our competitor's blenders... and visa versus. ABOUT THE Container: The OMNI Container has measuring markings up to 50oz but has really the space for ingredients of a 2 liter/64oz container. And of course, the OMNI Blender does not have the same brand name recognition as its famous competitors, but it also costs significantly less and is every bit as good as its competition. Regarding our power evaluation, we have determined in our testing that the OMNI V blending results in raw smoothies, soups, patee's, and puree's of a blending quality equal or better than blended by its competitors. Also note, competitors selling 2 and 3 hp high performance blenders in the $400's and $ 500's. 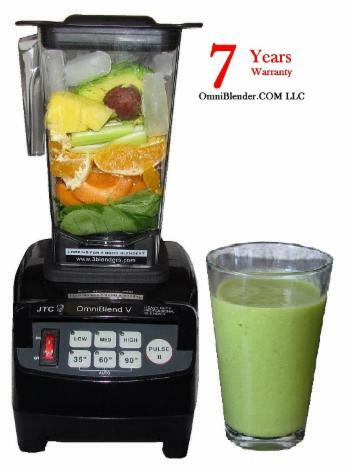 While money is not everything when it comes to quality, the OMNI Blender is sold at $240.00 USD with FREE shipping, although it is really a $ 500 blender. The main difference in Price is the Brand Name Recognition. Other blender manufacturers sell through multiple distribution levels while we sell consumer direct. So there is room for our referral program, which can give anyone the opportunity to make a few extra hundred dollars a week. 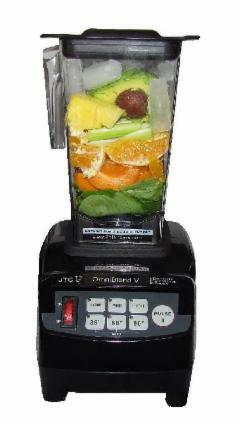 We offer now a 7 years standard limited warranty for the Omni V blender base and container. The improved blade in the OMNI Blender container that we supply has a 1 year warranty for residential applications. Commercial usage of the blender is 1 year. We can tell if a blender is being used commercially. Also, warranty is a manufacturer's way of promising that the consumer will not have any problems with the equipment purchased in respect to workmanship, faulty material or installation / assembly. If you use the blender every day, and if there is something incorrectly assembled or a faulty material / part has been used, you will be able to make a reclamation immediately. Even other competitors offer 7 years warranty. They know that you the consumer in all likelihood will not use the blender (60% chance according to statistics based on research) and therefore you will likely never make a warranty claim. And for that you are paying normally an extra $ 150 to $200.00. We do not charge extra because the blender is really as good as we promise it too be.